Laura Tyler took care of her grandmother while her grandmother was dying of cancer 20 years ago. Tyler is an artist, and she mainly worked on dark-charcoal and pencil drawings while serving as a caretaker, but her grandmother convinced her to paint. Tyler herself is dying of cancer now, and it's the painting, she says, that allows her to deal with the disease. "[My art] will be here a lot longer than I am. It's my investment, not just for my child or my husband or my family or my friends, but it's an investment for the world," Tyler tells Hair Balls. "My work has always been about my experiences, but when you're dying, living becomes so valuable, and that started showing through my work a lot." A couple of Tyler's paintings will be displayed and for sale at Saturday night's "Gone to Hell" show at H Gallery. One of her paintings, Love and Light Reverberated -- pictured at the top of this post -- is "about something that stands true and present over everything else that would jade you in this life," Tyler says. "It's about how all this existence here can wear on you, but there is a beautiful bubble of life that we have inside of ourselves, and if we can just be in tune with that, we can change what's going on," Tyler says. Tyler lived in Louisiana until she was diagnosed with synovial sarcoma in 2002, moving to Houston for treatment at M.D. Anderson. The cancer had spread to her lungs where she had developed about 30 tumors, making it nearly impossible to breathe. Doctors said Tyler probably wouldn't live for more than another year. "I try not to focus too hard on my prognosis," Tyler says. "I've been here a lot longer than they thought." 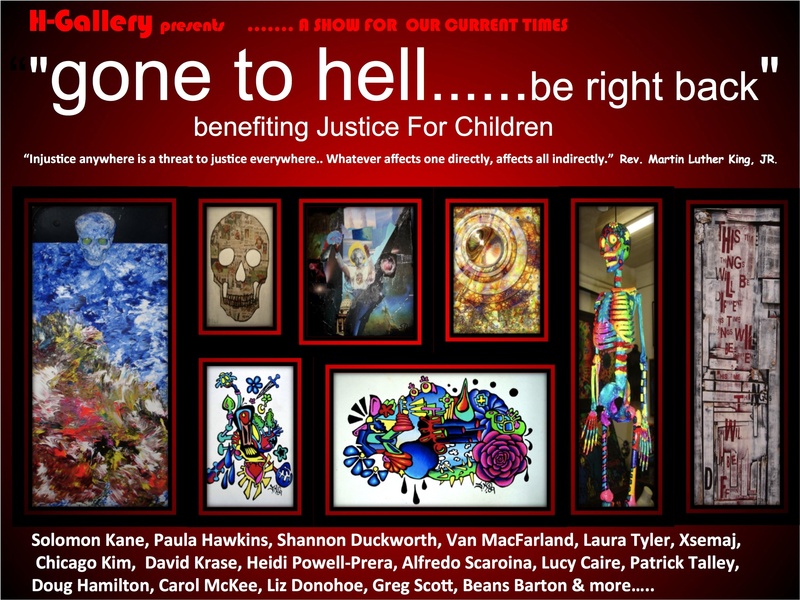 The "Gone to Hell" show benefits Houston's Justice for Children. Each artist is showing two pieces of art, and if sold, all proceeds from one piece will go to the organization, according to Solomon Kane, one of the participating artists.